In the course of moderating an e-mail discussion group over the years (ACT, which can be seen via this website), we have noticed that occasionally people’s attempts at e-mail humor go wildly, disastrously wrong, and ruffled feathers and even flame posts multiply with abandon. Since the ACT list is composed of astrologers and those interested in astrological techniques, we thought we would ask them what factors in a person’s chart have anything to do with "the funny." The vast majority of those who responded to our question indicated a feeling that Saturn and the sign of Capricorn are key factors in the exposition of humor. One of the issues that arose was: what kind of humor are you asking about? It soon became clear that there are many ways of getting a laugh or of laughing. Puns and a love of them were attributed (in part) to Mercury’s influence. Ribald humor was attributed to the influence of the sign Scorpio on Mercury (by one distinguished astrologer). Pluto got tagged as the indicator for their "dark" or macabre humor. And would retrograde Mercury, with its unintentional foul-ups, be the significator for Spoonerisms, a kind of unintentional humor? Venus would seem to be useful chiefly for giggles, rather than full-fledged belly laughs. This figures, since Venus is the planet most responsible for signifying areas of contentment in one’s life. Mars was given some credence as the instigator of "attack" comedy of the sort perfected by Don Rickles and Joan Rivers, and still practiced (in a more cerebral fashion) by David Letterman and Dennis Miller. Most standup comedians have to cope with hecklers, and my guess would be having a strong Mars would enable them to really pulverize such oafs. Pure high spirits might have something to do with Jupiter, and one writer associated Mercury-Jupiter contacts with puns. 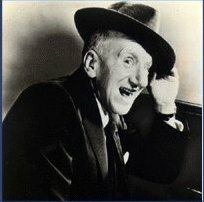 "Happy" humor (Jimmy Durante is an example) might be associated with Jupiter-Moon contacts. The same person who said this said "I have Jupiter on my Moon in Libra, and all it gave me is diabetes." We laughed, though it was true about the diabetes. Sarcasm, simple wittiness, dry humor and slapstick all got tagged with Capricorn associations. Saturn, classically "The Lord of Time," was considered to have something to do with the exquisite timing that professional comics and standup comics must have in order to be successful. Sometimes the impact of a joke is 100% in the timing of how it’s told, and Saturn definitely has a hand in that. One notion is that humor of the self-deprecating kind (Gilbert Gottfried?) might have something to do with Neptune and/or the twelfth (Neptune rules Pisces, sign of self-sacrifice). Another fine example of the species was Gracie Allen of long ago. Another notion is that Uranian humor might be something like Dennis Miller’s rants, but without the Martian tinge of anger. Monty Python, anyone? How about "Red Dwarf" or "Dr. Who" – would they fit into the Uranian mold? The centaur-class asteroid (it lies beyond the Kuiper belt) Pholus, was explored briefly as possibly having some kind of rulership over clowning. Joyfully making a fool of oneself. One of our midpoint afficionados cited an article that appeared in the March/April 1996 issue of "The Astrological Journal" which indicated that SO-UR-MC combinations occurred most frequently in professional comedians’ charts. In the article, it was noted that "anxiety" is part of the meaning of such configurations. Scorpios were most frequent in terms of Sun and Moon signs, and Libra’s were less frequent. As the most social sign (and socialized) sign, the low rating of Libra makes sense. Of all the signs of the zodiac (excluding perhaps Pisces) they would be likeliest to go along with the Emperor’s pretense to be wearing clothes – though they would probably know very well that he was naked. Generous Pisces, on the other hand, might actually see the Emperor in clothes! One astrology teacher rates contacts between personal planets with Pluto as conferring the gift of humor. A sense of the incongruous ("it doesn’t fit") is a factor in most humor. One might expect some kind of Virgoan insight to be a factor in this, though the person who mentioned this factor cited the realism of Saturn as the origin of these insights (e.g. "the Emperor isn’t wearing any clothes"). Here’s a notion: Sagittarians have a penchant for telling the truth ‘til it hurts. This is a factor in humor. One would expect to see a strong Sag connection in Will Rogers’ humor, and in Ellen DeGeneres’. The deliberate desire to shock might seem an Uranian or even an Aquarian trait – though, if Aquarius is involved, one would expect some sort of higher purpose. George Carlin comes to mind here, somehow. One of the list’s more studious members did a statistical analysis of the charts of a modest sample of comedians and comics. He had lot to say that wouldn’t be fair to summarize here. But the Ptolemaic planets were likeliest to be posited in either Aquarius or Aries, with Scorpio consistently coming in third place. Our most down-to-earth correspondent simply asked us to consider the many varieties of humor. How can we compare Alexander Pope’s couplets with the verse of Lewis Carroll, much less the humor in Gilbert and Sullivan, or the fond humor in Norman Rockwell’s illustrations. What do Jack Benny, Steve Martin and Chris Rock have in common, besides the fact their "thing" took place in front of live audiences? What astrological factors do you think indicate what’s funny? We’d love to hear from you and find out, and we’re perfectly serious about this!